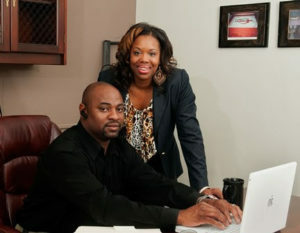 Camisha Farris was excited about a new contract for her company, Anointed Flooring, full service flooring contractors in Charlotte, providing commercial and residential flooring solutions for the government, prime contractors, schools, universities, public housing, military installations and multi-family housing. She was optimistic that a bank would loan her the capital she needed to expand her business, which had been in operation since 2004, and had the contract and documentation to prove her expected income. Unfortunately, the traditional bank turned her down. She eventually learned about TSC from the SBA. At first she was skeptical we could help. But once the loan was approved she became a spokesperson for TSC. TSC recently nominated Anointed Flooring for the Goldman Sachs 10K Small Businesses training and development program at Babson College.The company was called for an interview and is hoping to be among the final selection.